April Showers Journey Blog Hop – Welcome! 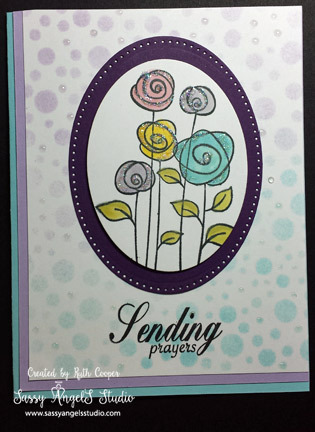 Welcome to the Fun Stampers Journey April Showers Blog Hop! If you arrived here from Wilma Payne’s blog you are right on track! No worries if you didn’t, just keep hopping right along to come full circle! We all know the saying “April showers bring May flowers” but sometimes life just brings us showers. Events happen, things don’t go as planned, someone gets sick, etc. So this month’s theme made me think of “Showers of Blessings”. Showing someone who is going through a difficult time that you care, you are thinking of them, you are sending them a bit of joy to brighten their day. I designed this months card with that in mind. I used the Bubble Bubble Stencil and applied Pretty Amethyst & Pool Play Fusion Inks by sponging on the color in varying degrees of light to dark. I stamped the sentiment from the Lead Me stamp set in Black Licorice. I applied this to a mat of Pretty Amethyst & then layered it onto a Pool Play card base to one side to create some interest. I then stamped the Rose Garden ATS (retiring) onto Whip Cream with Black Licorice ink (heat set). I used the reinker & Fusion Blending solution method of coloring the flowers & leaves. I die cut with Journey Ovals & used foam squares to layer onto a oval mat cut from Pretty Pansy to add some contrast & dimension. I then mounted onto my prepared card. I used Journey Glaze on just a few of the background bubbles to look like raindrops. After my raindrops dried, I added just a touch of Journey Glaze to the flowers & sprinkled with Journey Sparkle Dust. Thanks for stopping by this months blog hop. I’ll be a bit scarce on posts for awhile longer as we are preparing to move to a new home where I’ll be able to have a classroom to teach more techniques, cards, mini albums & more. Now Journey on over to Betsye Rose’s blog to see what she has in store for April Showers! I love the way you did the background! Very cute! Love the sentiment and the use of the stencils! So pretty! I love the colors and that beautiful soft background. Love this card; perfect sentiment! !